Many years ago, my sister’s two French colleagues came for dinner. I can’t remember their names for the life of me, but I certainly remember one of the dishes they cooked. Years later, this is still a party staple and is fondly referred to as, ‘Frenchie Pancakes’ but in fact it’s not a pancake and not a crepe. 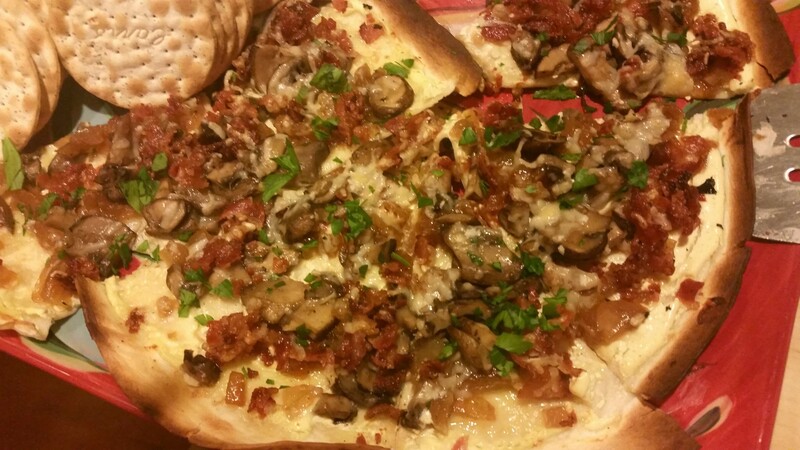 It’s more like a pizza on a very cracker-thin crust, which makes it perfect for an appetizer. What’s also amazing about this dish is its portability. It is easy to pack up the ingredients and takes 5 minutes to assemble and cook, once you reach your destination. 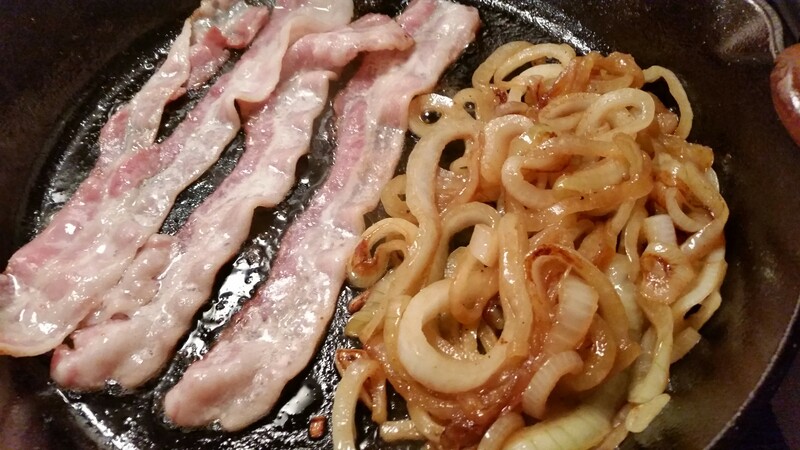 It all starts with some bacon…. 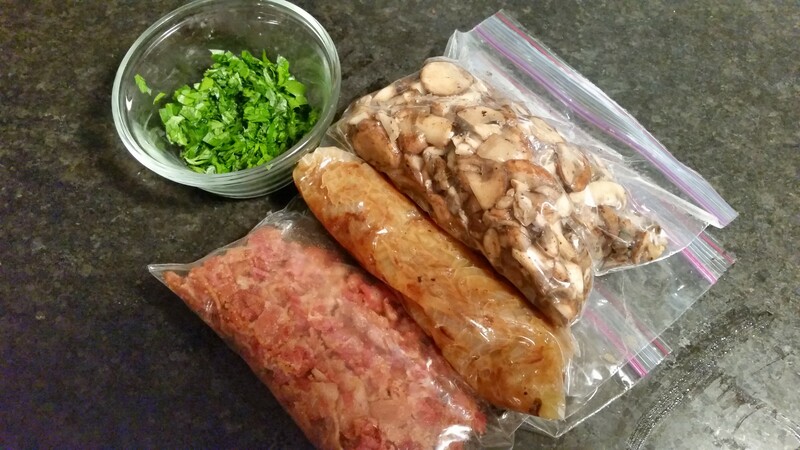 Once the bacon is crisp, you cook down in the mushrooms in a couple tablespoons of leftover bacon fat. 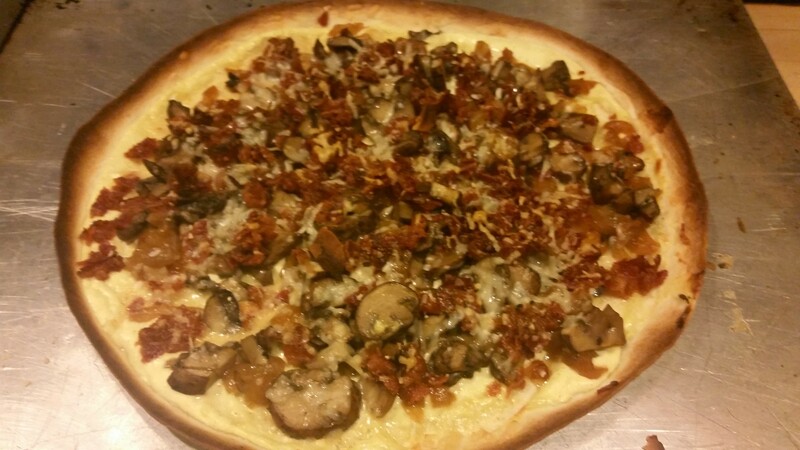 When all the water has evaporated and the mushrooms are soft, they’re done. Next come the onions. Caramelizing them in the pan used to cook the bacon and mushrooms is heavenly. 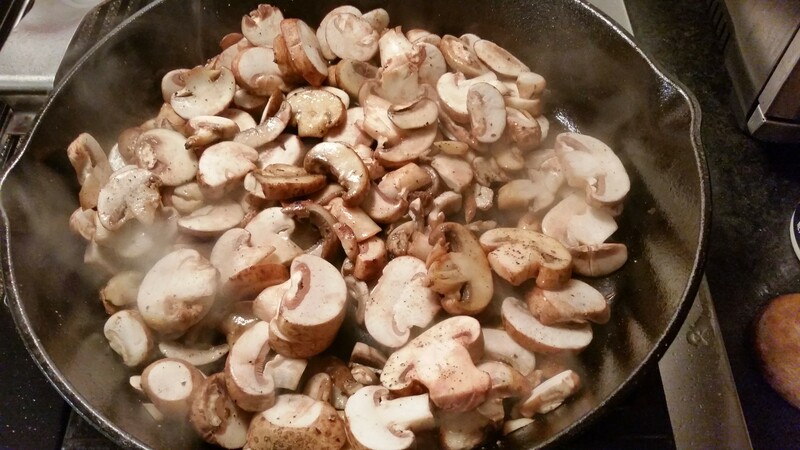 You may find that the mushrooms absorbed a lot of the fat so if the pan is getting dry, add a few more strips of bacon. Once the three main components are finished, it’s time to prepare the sour cream, chop some Parsley, grate the parm and pack everything up. 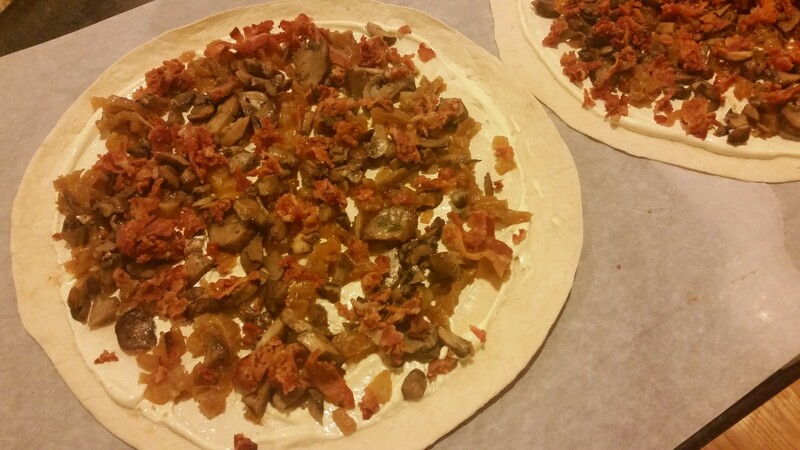 We’ve always used lavash bread or mountain bread for this recipe. You can usually find it in the deli section of the market. Spread the sour cream like you would a red sauce for pizza. 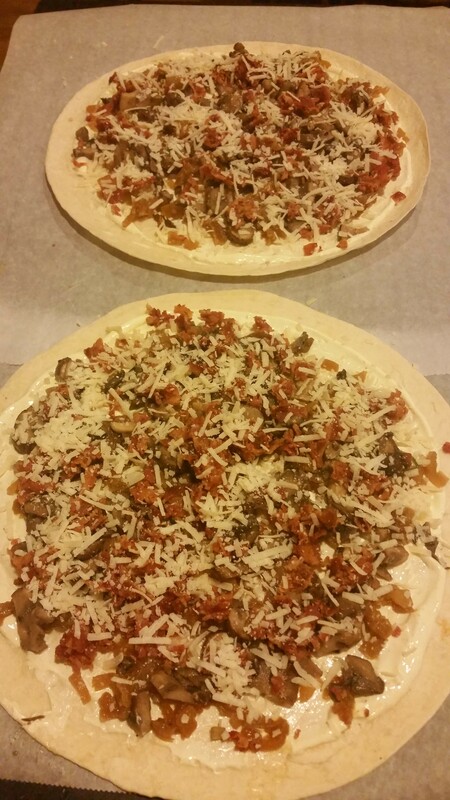 I generally start with the onions and then layer on the mushrooms, bacon and parm. Time for a quick broil and that’s it! Slice it like a pizza and serve it up! Fry the bacon in batches in a heavy skillet. When finished, drain all but a couple of tablespoons of grease. Add the mushrooms and cook on medium until all the liquid has evaporated. Season the mushrooms with salt and pepper, as they cook. 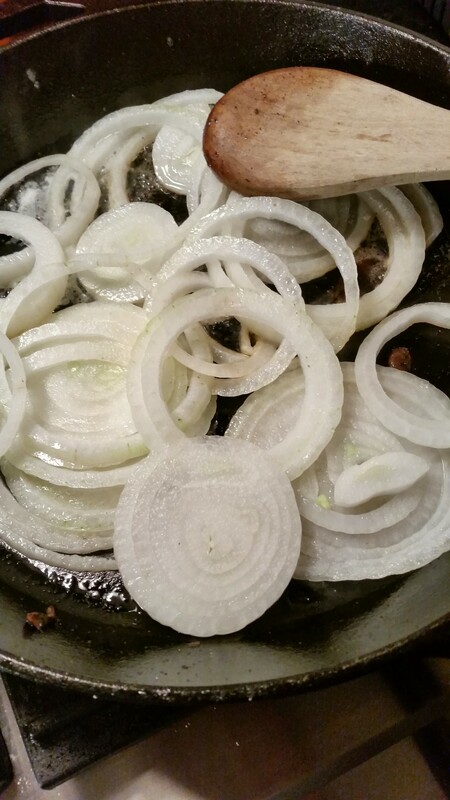 Remove the mushrooms from the pan and add the sliced onions. If you find the pan is getting dry, add a few additional pieces of bacon, or a tablespoon of butter. Cook on medium low heat until they’re caramelized. Season the onions while they cook. 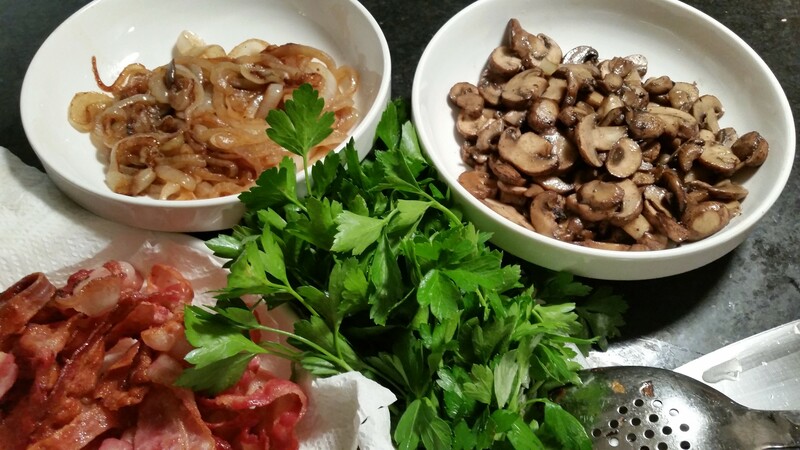 Chop the onions, mushrooms and bacon, when cooled. Mix the sour cream with the garlic powder and garam masala. 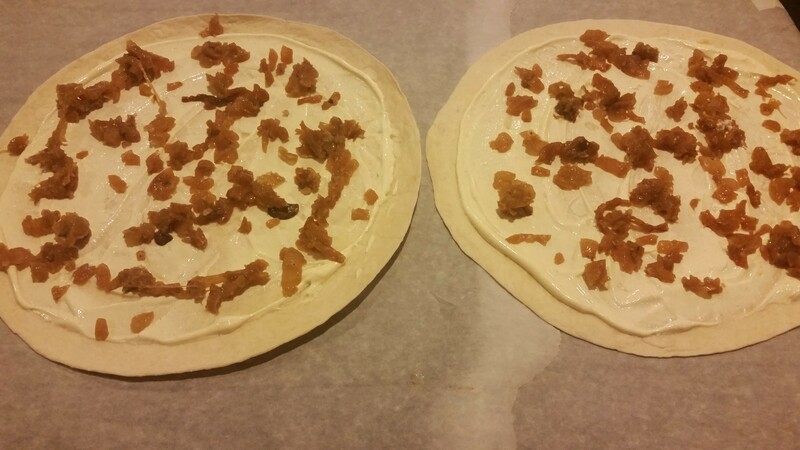 Spread a thin layer of the sour cream mixture on the lavash bread, leaving a 1/2” border. 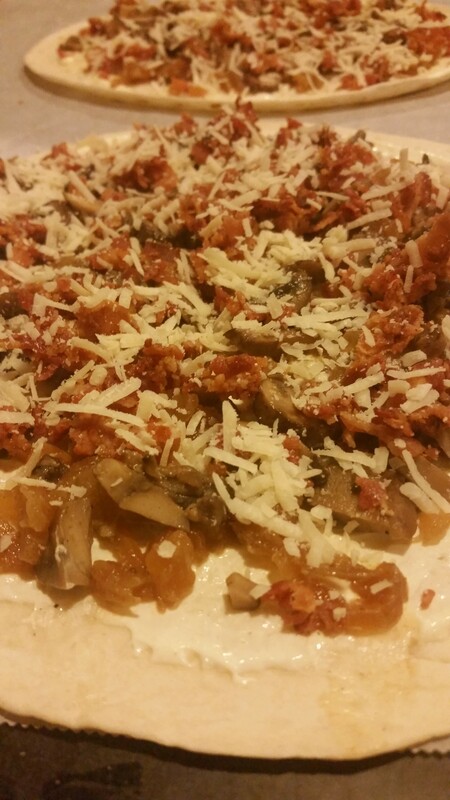 Sprinkle the sour cream with the onions, mushrooms, bacon and top with grated parm. Broil on a lightly greased cookie sheet for 4-5 minutes, or until the edges just begin to burn. Make sure the rack is in the middle of the oven as you don’t want the top to burn and the underside to be soggy.